The Silver Hand are a group of werewolf hunters. They are enemies of the Companions, as they are aware that the mercenary group's elite inner circle are lycanthropes. Hunters affiliated with the Silver Hand are known to brandish silver swords and seek to rid Skyrim of werewolves. However, while the Silver Hand solely hunts werewolves and members of the Companions, it is evident that the group is overzealous at best, and at worst is no better than a group of bandits, murdering unarmed civilians and torturing their captives, even those not suffering from lycanthropy. To spite the Companions, the Silver Hand also attempted to retrieve scattered pieces of Wuuthrad, the shattered axe of Ysgramor which was of great importance to them. Even if you are not affiliated with the Companions or the Circle and are not a werewolf, the Silver Hand are hostile and will attack on sight, which makes the members of the faction function similar to regular bandits. It is not possible to join the Silver Hand faction. Proving Honor: Claim a Fragment of Wuuthrad from Dustman's Cairn. The Silver Hand: Join the ranks of The Circle and clear Gallows Rock of werewolf hunters. Blood's Honor: Claim the head of a Glenmoril Witch for Kodlak Whitemane. Silver Hand members can be found in many other radiant locations during the related quests, replacing the usual dungeon enemies. Silver Hand members are apparently somewhat paranoid about being able to cure diseases, most likely due to their regular contact with werewolves and vampires. They have a 25% chance of carrying one or two potions of cure disease, and 5-20% chances of carrying 1-3 samples of each of the four alchemy ingredients with a cure disease effect (charred skeever hide, hawk feathers, mudcrab chitin, and vampire dust). If you hit a Silver Hand corpse with a soul trapping weapon, instead of receiving the standard message of "Silver Hand resisted Soul Trap", it will instead say "Bandit resisted...." or "Bandit Marauder resisted..."
Krev the Skinner is a radiant boss, whose race and gender is randomly determined when he or she spawns. Silver Hand members seem to vary in level and strength. Some Silver Hand members can prove very challenging to even medium-leveled characters (20-high 30's). Even if you are not a werewolf or vampire, you should practice extreme caution when approaching Silver Hand dungeons. 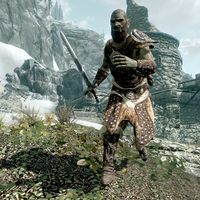 It may be possible that they follow the level lists of regular bandits (Some may possess the strength of a bandit outlaw for example, while some may be the strength of a bandit marauder). Similar to bandits, Silver Hand members mutter things that bandits say when they are unaware of your presence. This page was last modified on 21 June 2015, at 15:16.